Joined the gym after the indulgence of the festive season? You aren’t the only one… More people join the gym in January than any other month of the year – and in years gone by, I was one of those eager people in the queue to sign up. By early February, however, my enthusiasm always starts to dwindle. So this year, I’m keeping my credit card in my wallet and taking to my local pavements for a twice weekly jog instead. – Keep your shower gel simple and effective, with a tube of the addictive Clean Original Bath & Shower Gel, £11.80. It quickly works into a lather to clean post-workout skin – and leaves skin laced in subtle notes of Orange, Lime, Lily, and Musk. – If you follow your gym session with a few lengths in the pool, I recommend investing in a shampoo that specifically targets chlorine. Not solely reserved for beach holidays, the effective Schwarzkopf Professional BC Bonacure Sun Protect Shampoo, £6.38, cleanses chemicals from the hair – and leaves it feeling impressively soft. – If you’re in a hurry to get home and hit the sack – or get to your desk, if you’re an early riser – I suggest treating yourself to Crabtree & Evelyn’s Nantucket Briar Talc-Free Body Powder, £7.83. The velvety-soft powder will absorb any excess moisture you miss when drying off – allowing you to get dressed within seconds of stepping out the shower. – Brush locks with Mason Pearson Nylon Universal Military NU2M Hairbrush, £37.79. The professional quality brush will leave hair tangle-free – and it’s small enough to fit into your washbag. – If you’re feeling a little washed out, add some colour to your complexion by applying Clarins Hydra Care Tinted Moisturiser, £25.53, which comes in three well-formulated shades. Not only does skin feel soft and hydrated, but it appears smoothed and radiant. 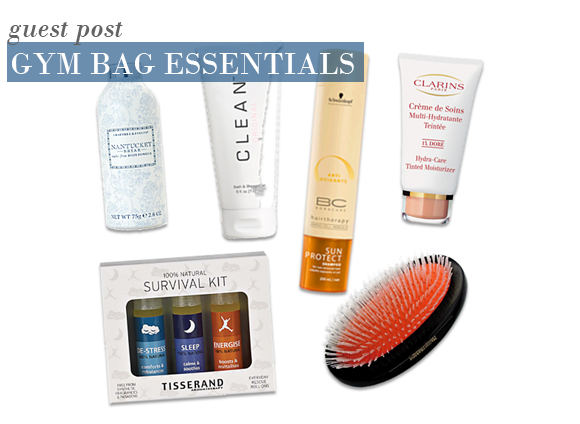 – I’m a big fan of Tisserand’s Survival Kit, £10.50 – and it’s ideal for use after the gym. If you are heading home, apply the ‘Sleep’ rollerball to pulse points before you step out of the changing room to help yourself unwind – but if you are heading straight to work, choose the ‘Energise’ rollerball to recharge energy levels. Keep the ‘De-Stress’ rollerball in your handbag for challenging moments throughout the day! Love this product, good but light coverage, nice colour. Very smooth and moisturising. Only wish it didn't come out of the tube so quickly OR that it came in a pump to avoid waste. Always come back to this tinted moisturiser, when have tried numerous others. This entry was posted on Monday, January 10th, 2011 at 9:37 am and is filed under Guest bloggers, Haircare, Make-up, Skincare. You can follow any responses to this entry through the RSS 2.0 feed. You can skip to the end and leave a response. Pinging is currently not allowed.